Hero mission: Find the center of the base! 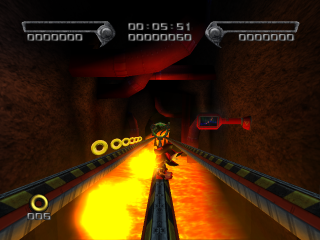 Lava Shelter is one of five possible sixth levels of Shadow the Hedgehog. In the game's branching path structure, it follows from taking a more neutral, non-aligned path through the previous levels. The stage sees Shadow infiltrating Dr. Eggman's volcano base; lava pits and Eggman robots are the hazards of the day. The Doctor's magma defenses cause grindrails to warp and melt as they are activated, so watch out for routes leading straight into molten rock. Camera angle trickery and similar-looking passageways mean it's more than possible to accidently turn yourself around in this level and start working backwards without realising it. The Eggman logos on the floor platforms can provide a clue as to the proper direction; if Eggman's head looks upside-down, you're going the wrong way! As Shadow seizes the fifth Chaos Emerald, his fractured memory is starting to come together again. Shadow remembers the fatal fall out of orbit after Finalhazard; waking up in a vat of green goo inside an Eggman base; and row upon row of other Shadows, stored neatly in their own capsules. Combined with Robotnik's devious insinuations through the previous course of the game, Shadow comes to a final conclusion: that he is a Shadow Android, an Eggman-made copy of the deceased original Shadow. Determined to seek out his creator for a final reckoning, the hedgehog races towards the Doctor's base. Circumstances, however, do not make things easy for Shadow. In Iron Jungle we see that - despite pushed to the limit in their war against the Black Arms - GUN has mustered the vast firepower and resources necessary to assault the Eggman Empire. Ivo has gone to ground, quite literally, retreating into a fantasticly supervillain-ish active volcano hideout. Indeed, the only participant of GUN's attack to even make it inside Lava Shelter is E-123 Omega, who asks Shadow for assistance in breaking through to the fat scientist at the base's core. Alternatively, Shadow can slow the GUN forces down by activating the base's defences, ensuring that his confrontation with Eggman won't be disturbed by those human nuisances. This page was last edited on 5 February 2018, at 19:16.